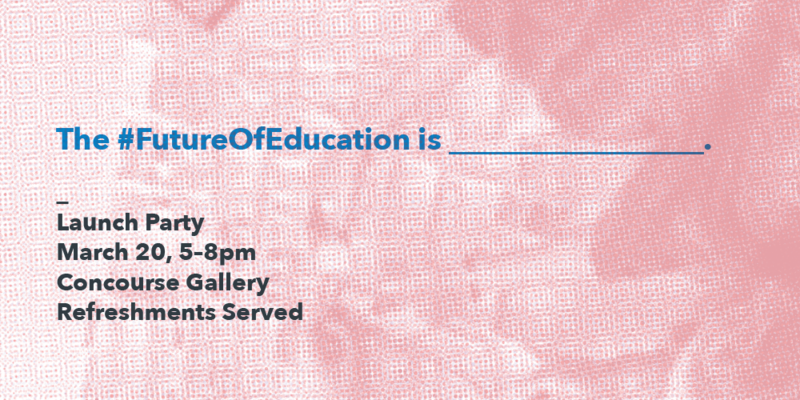 Join us in the Concourse Gallery for the official unveiling of the works created by the 10 winners of the Future of Education contest! Over the past 15 years in BC, post-secondary tuition has more than doubled, while per-student funding has declined by 20% (statistics courtesy Federation of Post-Secondary Educators of BC.). This has resulted in a massive rise of student debt, larger class sizes as well as overworked and under-resourced faculty, staff and students. Because of this, a sense of urgency has motivated students at Emily Carr to share their personal struggles with tuition and debt in order to motivate the public to call for policy changes ahead of the upcoming BC Provincial Election on May 9, 2017. The public is invited to attend the free exhibition opening and launch party (where they can see the diverse works of art, design and performance) on Monday, March 20 from 5 to 8pm in the Concourse Gallery at Emily Carr University of Art and Design. 5:00pm – Exhibition officially opens. RSVP on Facebook or Eventbrite. Thank you! Please share your thoughts, photos and videos using the hashtag #FutureOfEducation. Help us visualize the Future of Post- Secondary Education in BC. Do you see a dark future or a more positive vision? The Future of Education Contest is an Emily Carr University Faculty Association initiative with support from Federation of Post Secondary Educators and Open the Doors – a provincial campaign that addresses BC’s post-secondary education funding crisis. With the stories gathered in the Future of Education Project, we will collectively raise the profile of education leading up to the provincial election on May 9, 2017. We will connect our local stories to the broader need to support a creative, renewable economy in BC. We believe that the #FutureOfEducation must be inclusive and accessible for all.